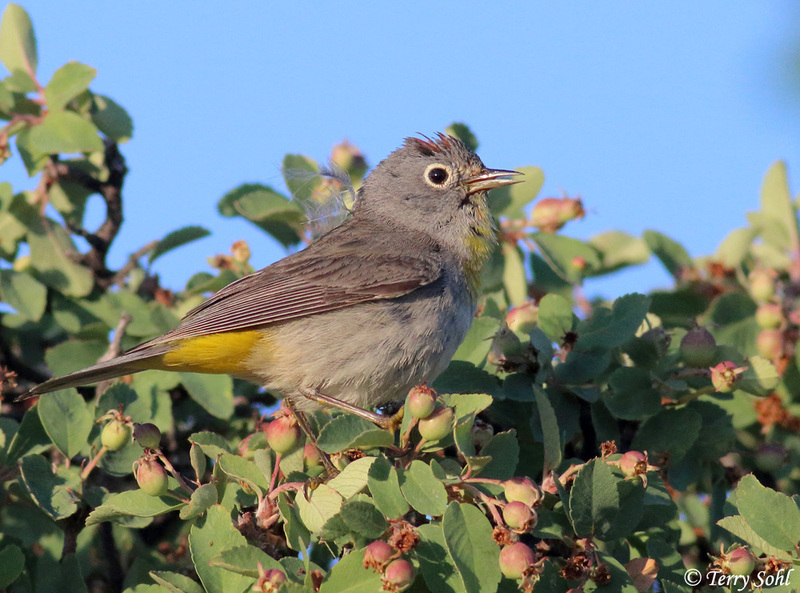 Virginia's Warbler is a bird of dry, brushy canyons of the western U.S. Virginia's Warbler was unknown in South Dakota until 1997, when many dozens of breeding pairs were found in extreme western Custer County (see Swanson et al. 2000). The find of this breeding population extended the known breeding range of the species by over 200km to the northeast of known existing breeding locations. 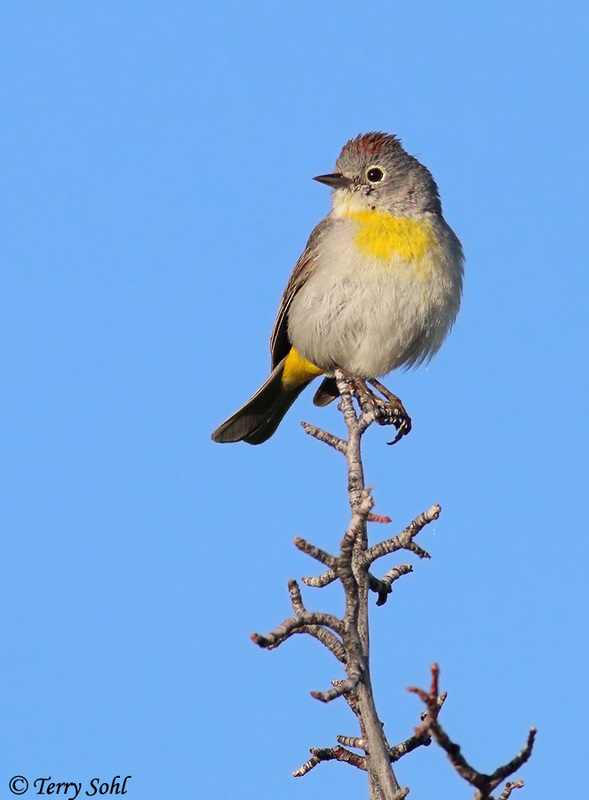 They remain as regular breeding birds in this area of South Dakota, and have also been found in a few other scattered locations around the Black Hills. They can be difficult to observe even in known breeding locations, given the density of vegetation they prefer to nest in. Habitat: Prefers low, dry, brushy habitats of the western U.S., including oak canyons, pinyon-juniper woods, and scrub oak. In their limited range in southwestern South Dakota, they are found in an area of "shrubby understory of skunkbush sumac and mountain-mahogany, with interspersed or adjacent Rocky Mountain juniper and ponderosa pine" (from Swanson et al. 2000, in The Southwestern Naturalist 45(1)). Most birds in South Dakota are found on slopes. Diet: Diet not known in detail, but nearly exclusively eats insects as with most warblers. Behavior: Will feed from the ground up into the canopy, although usually stays low in trees and shrubs and close to the ground. They glean insects from foliage and branches, or hunt for insects along the ground. 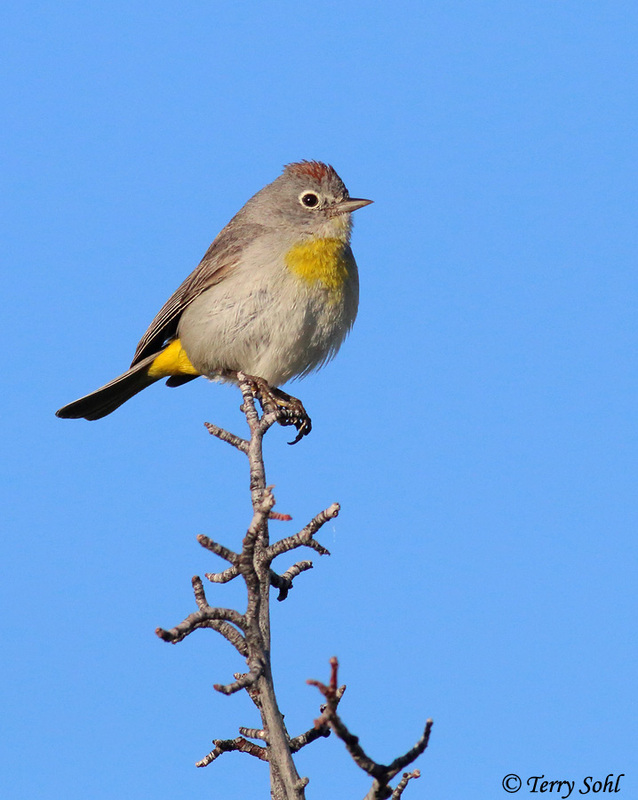 Virginia's Warblers will also occasionally fly out from a perch to capture flying insects in mid-air. Nesting: Late May through July. The nest is a cup, placed on the ground and built of grasses, lichens, moss, bark, and other vegetative material. It is usually lined with finer grasses and hairs. . The nest is usually placed next to cover, such as the base of a rock, a clump of vegetation, under a root, or next to a tree trunk. They prefer nesting on steep slopes, with the next placed on the downslope side of the primary cover element. The female lays between 3 and 5 eggs, with both the male and female helping to incubate them. The young hatch after about 12 days, and leave the nest after about 2 weeks. Song: Weak, poorly defined warbling, often consisting of two to three distinct parts. 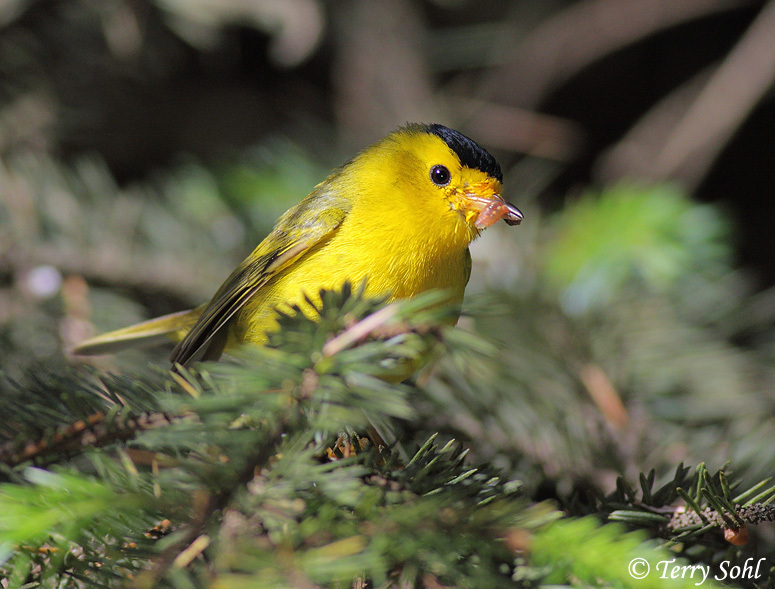 Click here to listen to the song of a Virginia's Warbler (audio courtesy of Ted Floyd). 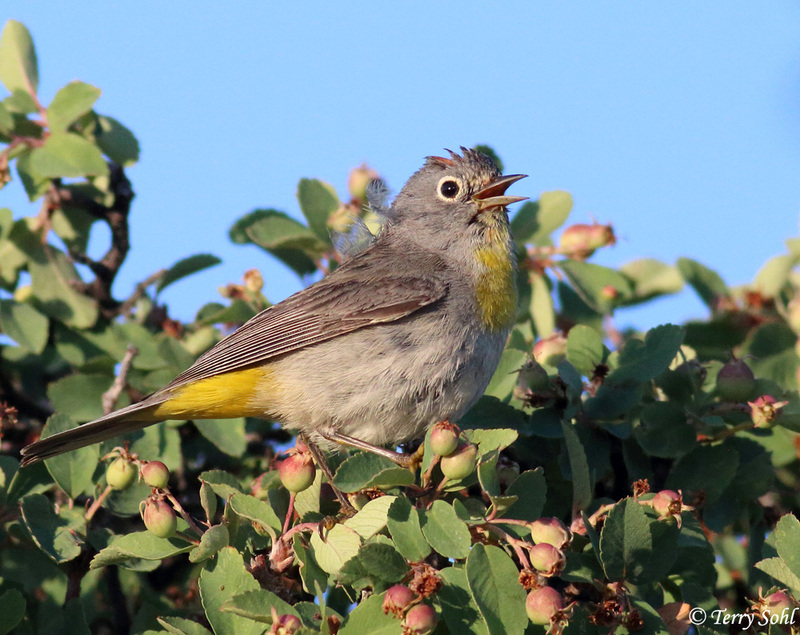 The call is a simple chip...click here to listen to a typical call of the Virginia's Warbler (audio courtesy of Paul Marvin). 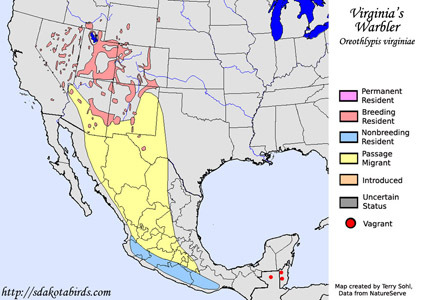 Migration: Summers throughout much of the inland western U.S. Neotropical migrant, wintering in Central and South America. 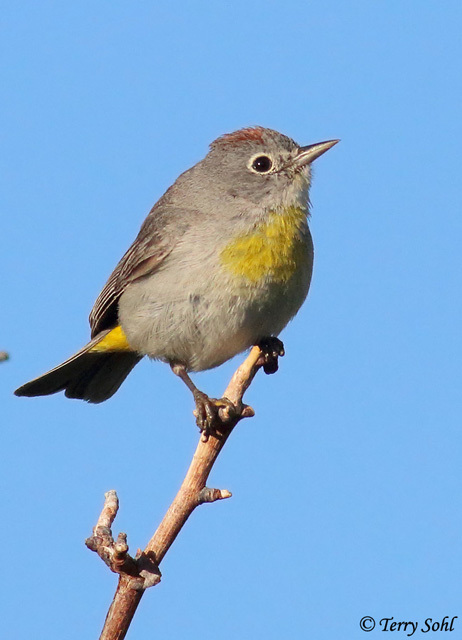 Similar Species: Potentially confused with Lucy's Warbler and the Colima Warbler in parts of their normal range. Conservation Status: Some locations show a decline, others show a potential range expansion (particularly in California). Overall numbers are likely decreasing slightly or are stable. 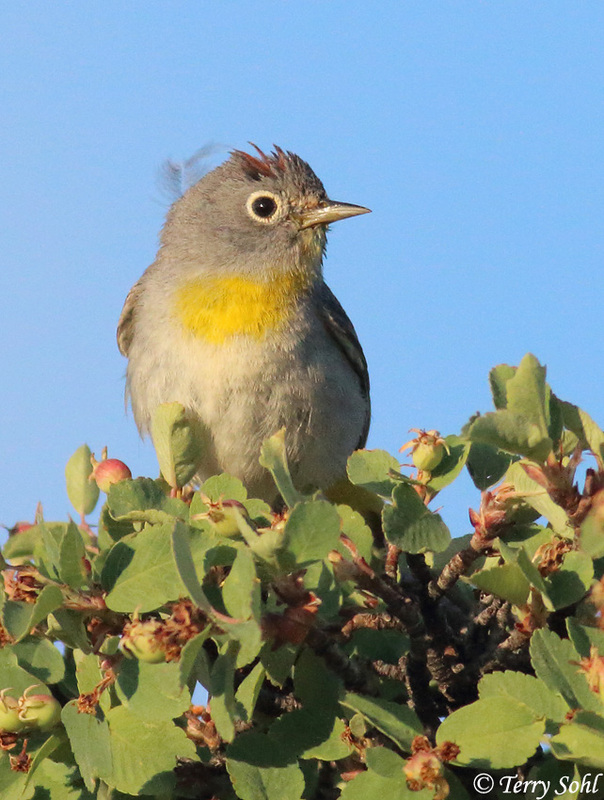 Overall, the IUCN considers Virginia's Warbler to be a species of "least concern". South Dakota Status: Uncommon and local summer breeding resident in western Custer County.